The wait is over! In our recent post, we mentioned that there will be a surprise gift only for buyers who pre-ordered the upcoming JYJ’s 1st Photo Book, ‘JYJ PREMIER COLLECTION -mahalo‘, and that surprise was unveiled lately! 50 lucky fans who pre-ordered this photo book via the 3hree Voices II Official Website from June 22 till July 12, are now absolutely in ‘jaw-dropping mode’ as these people can obtain true, authentic and exclusive signatures from Jaejoong, Yoochun and Junsu themselves by a fair random drawing. The signatures will then be printed into a big size photo as the photo book itself. Not enough with this surprise? The website also stated that there will be a DVD, which was initially planned only for the pre-order buyers, for everyone who bought this photo book from these three Korea, US and Japan websites of http://www.3hreevoices.com. 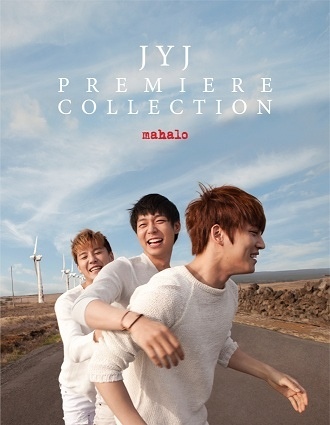 ‘JYJ PREMIER COLLECTION -mahalo’ will be released in August this year with a price of USD$88 with over 200 pages, featuring photos of JYJ from their previous Hawaii vacation. Are you one of those lucky 50 fans drawn to receive this surprise gift?